We’d love your help. Let us know what’s wrong with this preview of The Beauty Killers by Ann Girdharry. A collector who lures women. And when an undercover policewoman disappears, Kal and Marty take the case. A high-level detective is Women will go missing. And none will return. To ask other readers questions about The Beauty Killers, please sign up. I would like to thank Ann Girdharry for a terrific psychological third book in the Kal Medi series. Detective Chief Inspector Spinks has asked Kal Medi and her friend Marty to help him on a case. Women from the streets and at Clarence House (which is a safe haven for people on the streets) have gone missing. 1 of the women is a police officer. Something is off at Clarence House, there is a police officer who looks suspicious, staff who are being secretive. Kal has gone undercover to find out thin I would like to thank Ann Girdharry for a terrific psychological third book in the Kal Medi series. Detective Chief Inspector Spinks has asked Kal Medi and her friend Marty to help him on a case. Women from the streets and at Clarence House (which is a safe haven for people on the streets) have gone missing. 1 of the women is a police officer. Something is off at Clarence House, there is a police officer who looks suspicious, staff who are being secretive. Kal has gone undercover to find out things and befriends a young man who is looking for his friend (who is 1 of the missing women). Marty is undercover too at Clarence House, what will she find out and is her life in danger? What is Detective Chief Inspector Spinks hiding from Kal? This is the 3rd in the Kal series and it does not disappoint. You can read alone but to be honest you’re missing out if you don’t read the other 2, Kal is a deep character and they’re just really good books. This story gets Kal into her usual exciting fast paced dilemmas and you’re taken on a ride as she finds young woman going missing and why, not pleasant, and weird goings on. As always with these books I’m hoping to read more and see what she gets herself into next time, great character. 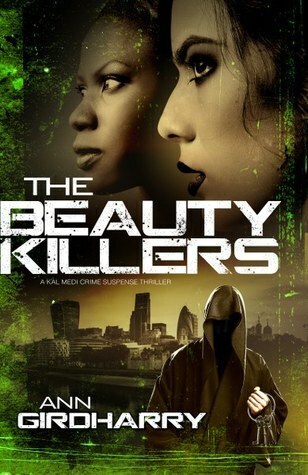 The beauty killers by Ann Girdharry. This was a fantastic read. I loved the story and I loved the cover. Kale was my favourite and I knew if anyone could find the missing girls it would be her. I do hope there is more to come from kal. It was a surprise to find out who it was in the end. 5*. This is the third installment of the Kal Medi series, and it is, by far, my favourite. In this novel, Kal is asked to help solve a serial killing case with ritualistic overtones. As per usual, the plot moves along at a quick pace, making it an exciting read. In addition, we gain welcome and deeper insight into one of Kal's associates, about which we've, so far, learned little. While there isn't much new information overtly revealed about Kal and Marty, there are some tells for the discerning read This is the third installment of the Kal Medi series, and it is, by far, my favourite. In this novel, Kal is asked to help solve a serial killing case with ritualistic overtones. As per usual, the plot moves along at a quick pace, making it an exciting read. In addition, we gain welcome and deeper insight into one of Kal's associates, about which we've, so far, learned little. While there isn't much new information overtly revealed about Kal and Marty, there are some tells for the discerning reader that reveal more of their character. There are also a couple of new characters introduced that I fervently hope we'll see again for the simple fact that they brought me so much joy. I found this was very quick to read, and I thoroughly enjoyed it. I look forward to Kal and Marty's next big case! Another suspenseful, psychological thriller by Ann Girdharry. I definitely can be read as a stand alone. I read Book 2, London Noir (if you did not read my review click here) --This is the third in the series--I will get to read the 1st eventually!! This killer picks and chooses the victims--all beautiful women--with no one who will miss them. The police detective sends in an under cover police woman--then she disappears--he calls on Kat to try and help him solve this mystery. She convinces her f Another suspenseful, psychological thriller by Ann Girdharry. I definitely can be read as a stand alone. I read Book 2, London Noir (if you did not read my review click here) --This is the third in the series--I will get to read the 1st eventually!! This killer picks and chooses the victims--all beautiful women--with no one who will miss them. The police detective sends in an under cover police woman--then she disappears--he calls on Kat to try and help him solve this mystery. She convinces her friend Marty to help her. Kat meets a young boy with Down's Syndrome--when he goes missing-(don't worry-he is found unharmed)-Kat goes ballistic. What is happening to these women and why will make you cringe. I have to be honest and say that I found it a little confusing reading this book, which isn't too surprising because this is the third one in the series and I had not read the other two. It CAN be read as a standalone but I think it is a good idea to read the first two, in order to get a reason for why Marty and Kal do what they do. Having said that, I found this book very gripping, the characters were well-written and I enjoyed (even though it was gruesome!) the case they were working on. I lik I have to be honest and say that I found it a little confusing reading this book, which isn't too surprising because this is the third one in the series and I had not read the other two. It CAN be read as a standalone but I think it is a good idea to read the first two, in order to get a reason for why Marty and Kal do what they do. Having said that, I found this book very gripping, the characters were well-written and I enjoyed (even though it was gruesome!) the case they were working on. I liked that the character of Dougie was written into the story as well, because it added a bit of much needed light with the shade. All in all, I thought it was an excellent novel and I would like to read the next one! This book is the third in the Kal Medi series and was sent to me by the author in exchange for an honest review. I have read all three of the books in this series and this must be my favourite, Kal is the type of friend that everybody needs, one who will defend you to the end!!! This is a gripping ,twisted tale of beautiful talented women who go missing for long periods only to wind up dead and dumped. When the kidnapper makes a mistake by abducting an undercover police officer Kal and her friend This book is the third in the Kal Medi series and was sent to me by the author in exchange for an honest review. This is a gripping ,twisted tale of beautiful talented women who go missing for long periods only to wind up dead and dumped. When the kidnapper makes a mistake by abducting an undercover police officer Kal and her friends are asked to find the missing woman and this ultimately leads to their identity. A fast paced gripping psychological thriller it’ll keep you guessing til the last turn of the page. I have previously read and enjoyed books by Anne Girdharry, so looked forward to reading her latest installment of her Kal Medi series. Kal is recruited by DCI Spinks, a trusted colleague and friend, to look for a police officer who has gone missing while undercover. With the help of her best friend, Marty, Kal's investigation uncovers all kinds of disturbing and horrific facts. An intense thriller, which will have you gripped. The story has all kinds of twists and turns, which will throw you of I have previously read and enjoyed books by Anne Girdharry, so looked forward to reading her latest installment of her Kal Medi series. Another great book by this author. More exploits with Kal and Marty and hopefully there will be more in the future. With every book we learn a little more about the characters. These really are action packed books with space to learn more about the main characters' past. Thoroughly tense; a riveting read that I would recommend. Thank You Ann for th9s book. Another amazing read about Kal . I was on the edge of my seat !! Fear, suspense , drama, tragedy, torture , .This book has it all. Will recommend this book to my book reading friends. Cannot wait to read another book written by this author . The Beauty Killers is the third book in the series. I really enjoyed this book. It is very exciting all the way to the end. The ending had some surprises. I really enjoyed the characters and the interactions between them. I enjoyed the dynamics between Kal and Detective Spinks. This book was my favorite in the series. I highly recommend this book and the whole series. Wow! Another high octane thriller! This book is the third in a series but also works well as a standalone. The author has created another masterpiece! This is a thrilling, fast paced story with unexpected twists and turns, loads of action and enough psychological angst to keep the reader glued to the pages. I love that Kal and her friend, Marty, are both strong, female leads with a “take no prisoners” attitude. This story kept me on the edge I received a review copy of this book from the author. This is the third book in the series but the only one I've read, it worked as a standalone but I'll definitely be reading the first two to se if it adds depth to the characters as I lt that was what stopped me giving it a five star! It's a fast paced psychological thriller that kept me guessing right to the end, missing women a man who collects them like I'd collect books, the signs of a gripping read. If you're looking for a new author I can highly recommend Ann Girdharry as a name to try! I loved books one and two in the Kal Medi series from Ann Girdharry, Good Girl, Bad Girl and London Noir, with Kal quickly having cemented herself as one of those very likeable, if somewhat unique, strong action heroes. When I was offered the opportunity to read the third book by the author, I didn't hesitate to say yes. Now if you have read any of the series at all you will know that Kal is a woman of high principals who will risk life and limb to help others, so when her old friend DCI Spinks a I loved books one and two in the Kal Medi series from Ann Girdharry, Good Girl, Bad Girl and London Noir, with Kal quickly having cemented herself as one of those very likeable, if somewhat unique, strong action heroes. When I was offered the opportunity to read the third book by the author, I didn't hesitate to say yes. Now if you have read any of the series at all you will know that Kal is a woman of high principals who will risk life and limb to help others, so when her old friend DCI Spinks asks her for help in finding a missing young woman, she doesn't have to think long before accepting. The woman in question is an undercover police officer, one of a number of young women to disappear under suspicious circumstances, the only known link being a shelter for the homeless. With the help of best friend Marty, Kal sets off on an investigation which could well prove to be deadly. What I have loved about this series, something which carries through into this book, is the central characters who lead us through the action. Kal Medi is a formidable young woman, trained well by her father in psychology so that she understand the way in which the human mind works and can easily get into the psyche of those she is hunting. Not only is she strong of mind, but of body too, and she would give any potential nemesis a run for their money. Which is just as well in this case as she is up against a very dark force here, a person who is very malevolent and whose motivations are skin crawlingly sadistic. Now Kal can be impulsive, never hesitant to act, and to balance this you have Marty who is now in business with Kal and who acts as a kind of safety net, forcing Kal to think more about what she is risking. Marty is the far more hesitant of the pair but together they are a brilliant team and more than enough of a match for anyone who should cross them. ‘Women will go missing. And none of them will return. A collector lures women. And keeps them.’ Those first sentences in the synopsis drew me in straight away. I was hooked from the first page of this fast paced book and it definitely didn’t disappoint. Full of tension and suspense, this story will grip you and have you on the edge of your seat waiting to see what happens next! Another fast paced thriller featuring Kal Medi. If you read the first 2 books you’ll get a better understanding of Kal and Marty but you don’t need to. A great read and series. This author definitely tackles some serious issues. I enjoyed this book as well as the other books in the series. I find myself wondering if fiction were reality, Kal would be someone I would want in my corner. She has had a difficult upbringing and yet still has the ability to care for and help others. I read this book filled with so many emotions. Finding out who the “Master” was filled me with shock. Yet I could believe it given my own past. I am hoping there will be many more in this series, This author definitely tackles some serious issues. I enjoyed this book as well as the other books in the series. I find myself wondering if fiction were reality, Kal would be someone I would want in my corner. She has had a difficult upbringing and yet still has the ability to care for and help others. I read this book filled with so many emotions. Finding out who the “Master” was filled me with shock. Yet I could believe it given my own past. I am hoping there will be many more in this series, I want to continue to follow Kal and Marty on their adventures. She is a trained psychotherapist and worked as a manager in the not-for-profit sector. Today, she lives in Montpellier, France with her husband and two children. Her debut novel, Good Girl Bad Girl, is an ERIC HOFFER BOOK AWARD Finalist 2017 and a READERS' FAVOURITE Five Star Book. I love to travel and v Ann Girdharry is a British, crime thriller author. I love to travel and visit different cultures. As an adult, I've lived in the USA, Norway, UK and France. Be the first to know about my new releases by joining my Reader's Group. (No spam, I promise! ) - details on my website.